Synthetic peptide corresponding to Human MAGE3 (C terminal) conjugated to keyhole limpet haemocyanin. Jurkat lysate. This antibody gave a positive result when used in the following formaldehyde fixed cell lines: A431. Our Abpromise guarantee covers the use of ab38496 in the following tested applications. WB 1/100 - 1/500. Detects a band of approximately 35 kDa (predicted molecular weight: 35 kDa). Proposed to enhance ubiquitin ligase activity of RING-type zinc finger-containing E3 ubiquitin-protein ligases. May enhance ubiquitin ligase activity of TRIM28 and stimulate p53/TP53 ubiquitination by TRIM28. Proposed to act through recruitment and/or stabilization of the Ubl-conjugating enzyme (E2) at the E3:substrate complex. May play a role in embryonal development and tumor transformation or aspects of tumor progression. In vitro promotes cell viability in melanoma cell lines. Antigen recognized on a melanoma by autologous cytolytic T-lymphocytes. Expressed in many tumors of several types, such as melanoma, head and neck squamous cell carcinoma, lung carcinoma and breast carcinoma, but not in normal tissues except for testes and placenta. Never expressed in kidney tumors, Leukemias and lymphomas. 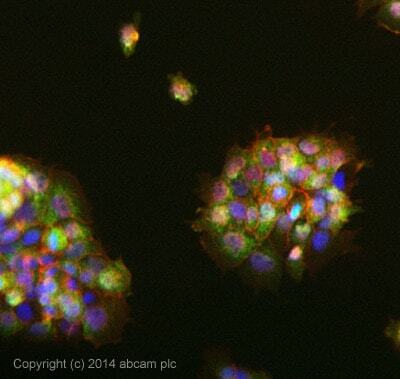 ICC/IF image of ab38496 stained A431 cells. The cells were 4% formaldehyde fixed (10 min) and then incubated in 1%BSA / 10% normal goat serum / 0.3M glycine in 0.1% PBS-Tween for 1h to permeabilise the cells and block non-specific protein-protein interactions. The cells were then incubated with the antibody ab38496 at 5µg/ml overnight at +4°C. The secondary antibody (pseudo-colored green) was Alexa Fluor® 488 goat anti- rabbit (ab150081) IgG (H+L) preadsorbed, used at a 1/1000 dilution for 1h. Alexa Fluor® 594 WGA was used to label plasma membranes (pseudo-colored red) at a 1/200 dilution for 1h at room temperature. DAPI was used to stain the cell nuclei (pseudo-colored blue) at a concentration of 1.43µM for 1hour at room temperature. Publishing research using ab38496? Please let us know so that we can cite the reference in this datasheet. Hi. Actually it is liked the one that I sent you previously, with some non-specific bands between 50-120 Kda. I would like to replace it with anti-Nectin-3 (ab63931). Thank you very much for your help. Thanks for your reply. I am sending a free of charge vial of ab63931 on the order ***, which should arrive tomorrow. Please keep me updated of the results using this replacement antibody, and let me know if there is anything else that we can do for you. Hi. The testis, Sertoli cells and germ cells are of rat origin, therefore we know that it might not cross react with the human antibody. But we used 45ug of Jurkat cells lysate in the blot and there is no signal. Over the weekend, I tried to add more antibody to 1:100 and incubated it overnight at room temperature. There is still no specific band seen on the immunoblot. I checked the other MAGEA3, two of them are used to detect the fusion protein, which is supposed to be very strong already and the other one it is only suitabel to IHC. Is that possible if we can get a replacement of another antibody? Thank you for your reply, and I'm sorry to hear that the antibody still did not work at 1:100. Did you see any bands at all on the blot, even at unexpected molecular weights? I would be happy to send a different antibody as a replacement. What antibody are you interested in? Hi. I am writing to enquire about an antibody that we purchased on 9/15/2011, anti-MAGEA3 antibody (Cat # AB38496). We tested this antibody by immunoblotting using testis, Sertoli cells and germ cells and Jurkat cells. MAGEA3, which is a cancer/testis antgen, is supposed to express highly in testis and germ cells. The molecular weight of MAGEA3 is supposed to be about 35 kDa. However, we cannot detect any bands around that region, even with Jurkat which is the positive control stated in the specification sheet. We tried to block the membrane with either 4% BSA and 5% non-fat dry milk. The antibody was used at 1:500, incubated overnight at 4'C. We would like to know if there is any other lot of MAGEA3 available so that we can replace that. Thank you. Thanks for contacting us and letting us know about the trouble with ab38496. What species are the testis, Sertoli, and germ cells from? This antibody is tested in Jurkat cell lysate at a 1:100 dilution, so we would recommend increasing the concentration of the antibody in order to ensure that it is working properly. You can also increase the signal by loading at least 30 ug of lysate per lane and diluting the antibody in TBST without milk or BSA. We do not have another lot in stock of ab38496, however we do guarantee all of our products to work as stated on the datasheets for up to 6 months, so if there are still no bands on the blot after increasing the amount of antibody, I would be happy to send a different MAGEA3 antibody or alternatively issue a credit or refund. Please let me know if you have any questions or if there is anything else that we can do for you.